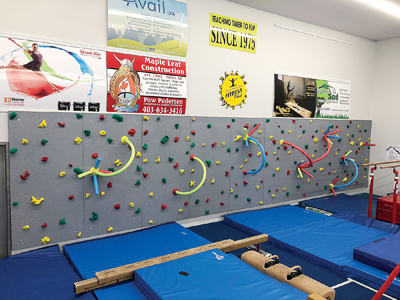 Taber Gymnastics Fitness Club (TGHC) has had to restructure how it runs after changes in its governing body, the Alberta Gymnastics Federation. The federation banned all use of trampolines during any public events such as open gym, birthday parties or school field trips. “The Taber Gymnastics Fitness Club has always prided itself on not being just a facility exclusive to registered athletes in classes, so the club had to close open gyms temporarily to restructure due to this sudden unforeseen change,” said Danielle Hansen, a head coach with TGHC. After restructuring, the TGFC offered semi-structured themed drop-ins randomly throughout the fall months, hoping it would continue to provide a quality drop in without the use of trampolines. The change did not resonate with users and so the club conferred with parents, kids and the public to find out what they would like to see at the fitness club, in which it was unveiled earlier this month, a climbing wall. “Since the climbing wall was installed in the gym two weeks ago, we have had several school field trips and the climbing wall has been a hit. The kids love it,” said Hansen. To check out all the full changes to open gym, times and other tweaks to the gymnastics and fitness club, check out the club’s Facebook Page, website at http://www.tabergymclub.com or you can call the club at 403-223-5437 for more information.